TM-8811 Ultrasonic Thickness Gauge (1.2-200mm/0.06-8inch). Measuring range (metric/imperial): 1.2-200mm, 0.06-8inch. Materials measured: any hard materials, including steel, cast iron, aluminum, red copper, brass, zinc, quartz glass, polyethylene, PVC, gray cast iron, nodular cast iron and other materials. Lower limit steel pipes: 15×2.0mm, 20×3.0mm determined by the transducer. Accuracy: ±(0.5%n+0.1). Power supply: 4×1.5V AA(UM-3)battery. Battery indicator: low battery indicator. Operating conditions:0-+45(32-104), 90%RH. Weight: 208g (not including battery). 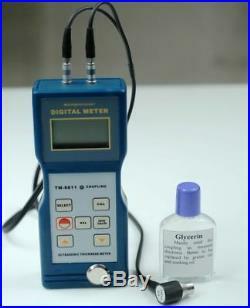 Package include: Ultrasonic thickness gauge, English manual, Packing box. Optional Accessories: 6M6mm thin Material probe:Measuring range(steel): 1.0 50.0mm Operating temperature: -10+60 5M12high temperature probe: Measuring range(steel): 1.0225.0mm(normal temperature) Measuring range(steel): 4.0100.0mm (high temperature) Operating temperature: -10+300. If you have any questions or comments whatsoever regarding our products or listing, we are waiting to hear from you. 30 days evaluation and investigation takes placed after receiving your return item. The item “Ultrasonic Thickness Gauge, Meter, Tester for Steel, Glass” is in sale since Friday, February 20, 2015. This item is in the category “Business & Industrial\CNC, Metalworking & Manufacturing\Metalworking Tools\Metalworking Inspection & Measurement\Inspection Gauges”. The seller is “filling-parts” and is located in Wenzhou, ZJ. This item can be shipped worldwide.